The polls are open and an early report of a problematic opening at the Brandt School rectified but others reports have arrived of a different more troublesome scourge. Beth Mason based on one unconfirmed report, for reasons unknown went to the Calabro School polling station. She does not vote in that location and it's unknown why she felt compelled to be there as it's in the sixth ward. Perhaps it can be summed up in two words: Jen Giattino. Reports from the sixth ward highlight the disgusted reaction of Hoboken residents to the foul four mailers paid with the unaccounted funding of a PAC "Real Democrats for Hoboken." The day before the fourth mailer, MSV actually predicted another would arrive based on the Beth Mason fabrication saying Jen Giattino attended the 2014 Super Bowl on the taxpayers dime. Most observers conclude the fabrications were part of a paid effort by the Mason family checkbook as there's no funds beyond $300 known to be available to the PAC connected to John Keim (Chairman) and Ines Garcia Keim (Treasurer). 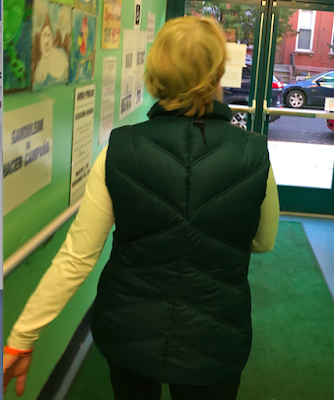 Beth Mason was turned away from the Calabro School Polling Station and had to leave. away and told to leave. Talking Ed Note: Initial problems and a slow start at the Brandt School polling location were fixed but there's already been a report of the Hoboken Police Department being called in at the Hudson Tea Building. A reported Peter Biancamano campaign person and Frank "Pupie" Raia associate was said to be at the fulcrum of an issue with loud arguing about electioneering at the polls. The beautiful day as MSV was out and about early had an undertone of Horse Sense: today would be "contentious." Councilman Peter Cunningham stated there's 200 Vote-by-Mail ballots he attributes to his opponent's campaign, Eduardo Gonazalez who is running on the Russo faction Carmelo Ticket. MSV spoke to a senior member of the Eduardo Gonzalez campaign this morning. They would neither confirm nor deny the figure of 200 attributed to Peter Cunningham. As many know, there's been suspect direction from the Ruben Ramos campaign to have Vote-by-Mail voters go to the polls today and vote on a provisional ballot. How such a recommendation is legal is unclear. 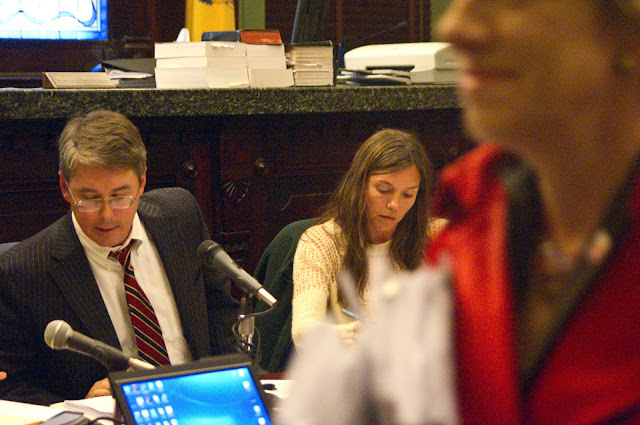 Council members Peter Cunningham and Jen Giattino at a 2012 council meeting as Beth Mason arrived late with a wry smile the night the Nazi Truck was parked right outside the meeting of City Hall running a venomous attack video against the council members featuring a Nazi flag. Beth Mason has never denied her role in the Nazi Truck nor apologized for the attack on her council colleagues or responded to a requested apology from Hoboken rabbis. It's been a long and grueling two weeks of campaigning. Quite frankly, it's been a long and grueling 8 years to turn Hoboken around on so many fronts. We are at a serious turning point for our City, and it's offensive my opponent claims I have done nothing over 8 years. You really have to ask, where did this guy come from to make such a statement? And that leads us to tomorrow's vote. For those unaware, or not following, my opponent and his team are trying to steal this election by abusing the Vote By Mail process. When the polls open tomorrow, he will have almost 200 (VBM) votes to start. I know, I have seen the VBM reports from the County. The County Election Officials are investigating potential fraud. I can assure you I will take any and all actions necessary to fight voter fraud. To mitigate this matter, we must show up at the polls and VOTE. In the end, every vote will count as this will be a VERY CLOSE ELECTION! We have come too far to turn back to the corrupt ways of the past. Please take the time, and to ask a friend as well, to VOTE - 1C. 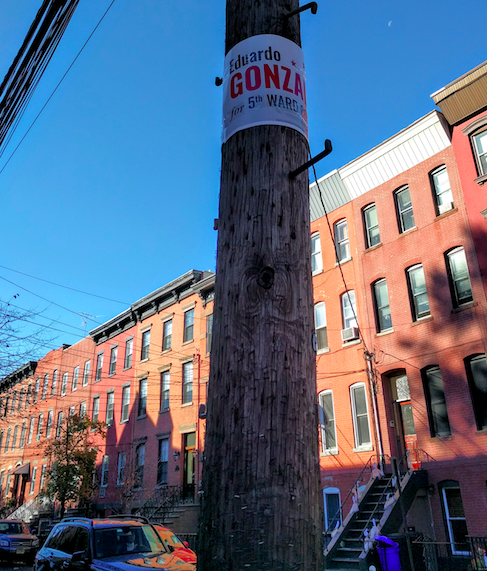 Gonzalez campaign has erected this illegal campaign sign at 9th and Bloomfield. Send any photos and concerns or items of election interest to smartyjones@me.com. Da Horsey thanks you in advance for your civic participation.